A couple of weeks ago I went to get a pedicure and while I was waiting for my toes to dry I spotted this new product in a magazine. It's L'Oreal's Blow Dry It spray. Not only does it offer heat protection from blow drying but it's also supposed to cut your drying time down. I must say I was skeptical at first but definitely thought it was worth a try so I picked up a bottle at my local Target. 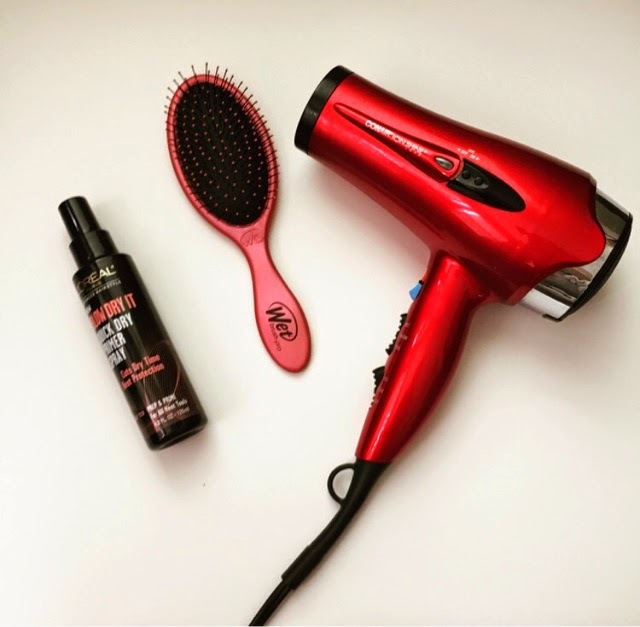 I've never really timed how long it takes to dry my hair but I know it seems like a long time so for this review I timed how long it took to me to dry my hair with and without using this product. When I dried my hair without using the spray, my drying time was about 10 minutes. With using the spray, it only took 7 minutes. I was so surprised and was amazed that it actually worked! After I washed my hair and got the excess water out with a towel, I used this brush (BEST BRUSH EVER) to get any tangles in my hair and sprayed my hair with the blow dry it spray. I then clipped the top section of my hair with a hair clip and sprayed the section with the spray again. I dried this section of my hair and then repeated the process for the top section of my hair. I definitely would recommend this product! Not only does it do double duty by offering heat protection and cutting drying time down, it also smells really good!